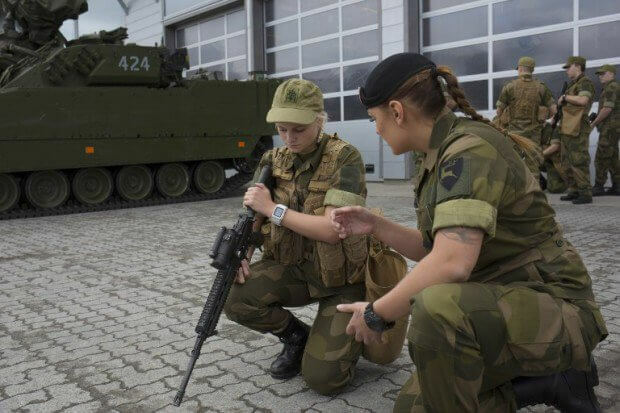 The military’s gender balance is not entirely equal yet, but almost a third of the Norwegian army conscripts born in 1997 were women this summer. At the Setermoen army base just above the Arctic Circle, new recruits in an armored battalion are learning to handle assault rifles for use on combat missions. Here and there, long ponytails stick out behind the recruits’ caps. 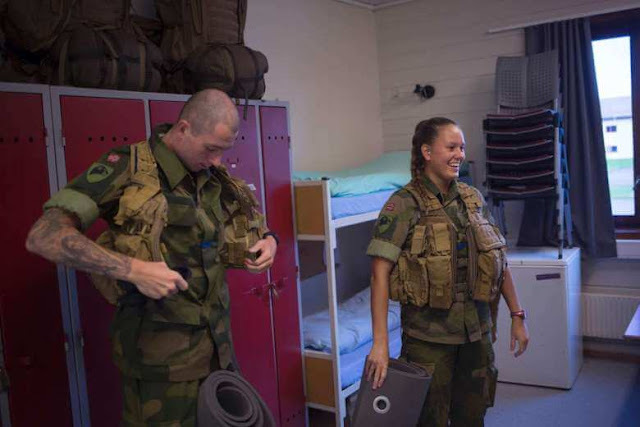 They sweat together, they sleep together: in the name of gender equality, Norway has introduced compulsory military service for women, even bunking them in mixed dorms with their brothers-in-arms. 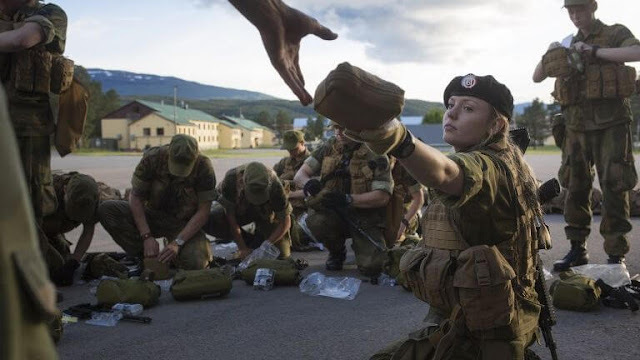 The military’s gender balance is not entirely equal yet, but almost a third of the Norwegian army conscripts born in 1997 were women this summer. At the Setermoen army base just above the Arctic Circle, new recruits in an armored battalion are learning to handle assault rifles for use on combat missions. Here and there, long ponytails stick out behind the recruits’ caps. “It gives me a bigger recruitment pool to choose from,” the battalion chief, Lieutenant Colonel Pal Berglund, says of the new gender equal draft. Norwegian women have been able to volunteer for military service for almost 40 years now, helping to gradually feminise the armed forces. The military welcomed its first female helicopter pilot, female jet fighter pilot and female submarine commander already in the early 1990s. But in 2013, at a time when the prime minister was none other than current NATO Secretary General Jens Stoltenberg, a virtual unanimous parliament passed a law applying military conscription to both sexes. The Scandinavian country — where four of the last five defense ministers have been women — has thus become the first North Atlantic Treaty Organization member and European country to draft both men and women, joining a tiny group of countries around the world, including Israel. “In operations, it’s an advantage having females. They have access to parts of the population that men don’t have, for instance for intelligence gathering,” says Berglund. The army needs less than 10,000 new recruits each year, far fewer than the 60,000 who are liable to be called up. That means that only the most motivated will actually be asked to serve, in a country where military service is often seen as a personal accomplishment highly valued on the job market. “It enables you to cut the umbilical cord. It’s good that girls and boys get the same opportunities,” says new conscript Marianne Westum. The 18-year-old shares living quarters with another woman and four men. Camouflage gear and a military-issued flask are neatly organized in a metal cupboard, only a bra and handbag indicating the presence of a woman. Is it not tempting fate to throw young men and women together in unisex bunks? “We see that exposure to each other increases tolerance, acceptance and understanding toward each other,” insists Nina Hellum, a researcher at the Norwegian Research Defense Establishment.